Dr. Rheta L. DeVries is emertius Professor of Curriculum and Instruction at the University of Northern Iowa. Currently engaged in full-time research, she is principal investigator of a National Science Foundation grant. From 1993 to 2006, she was Director of the Regents' Center for Early Developmental Education (a statewide center created by the Iowa Legislature in 1988) located at UNI. Having received her doctorate in psychology from the University of Chicago in 1968, Dr. DeVries is a developmental psychologist who began her career with work on cognitive development in young children. Inspired by the work of Jean Piaget, Dr. DeVries did research on the development of generic identity, perspective-taking, conceptions of shadow phenomena, and the relations between psychometric and Piagetian measures of intelligence. She became interested in education, in part a result of her four years of work prior to graduate school, as a teacher in elementary and junior high schools in Illinois. Dr. DeVries is the author of numerous publications which include several books on physical knowledge, group games, constructivist education (overview and comparison with other programs), Piaget's theory and preschool education, and the sociomoral atmosphere. Her current research addresses: classroom observation instruments that purport to assess developmentally appropriate practice in early education, the development of a new instrument, the effectiveness of dilemma discussion in promoting children's sociomoral reasoning, and constructivist early primary education. If you think the words young children and physics don’t belong together, think again. 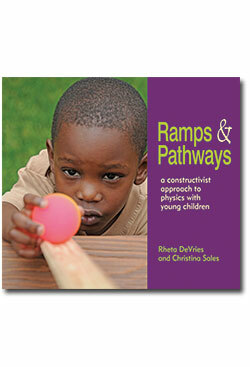 Use ramps to engage children in deep reasoning about physical objects and phenomena such as force and motion.